Looking good: Colin, Goh and Se are three top players from Kwan’s Birdie Club and very happy with this week’s result and the top ranking in the PPL. Kiki Sports Bar was playing at home against Ting Tong. Kiki had their table serviced this week and a new cloth installed. Gervais started well and won his single and double games. However, all other players from Kiki lost their singles, so maybe they were not yet used to their new table conditions. Nick and Paul both playing for Ting Tong won their singles and doubles games. It was 3-6 before the beer leg for Ting Tong, and Kiki’s team stood up to be counted and won the beer leg in two sets, but lost the night to Ting Tong 6-5. Natalie played away against Martin Swiss. Roby, Martin and Jig all playing for Martin Swiss won their singles and doubles games. Natalie team was missing top players Nui and Andrew B.D. and had a hard time against Martin Swiss. The beer leg was a three-setter and won by Martin Swiss, who also won the match with a score of 8-4. Champs bar played at home against Genius. It was interesting to see if Champs could continue their winning ways. After the singles it was 3-3 but Genius came back strongly and won all three doubles. Wan, Poy and Toon all playing for Genius won their singles and doubles games. The beer leg was a two-setter and won by Genius, who also won the evening by 8-3. Red Light played at home against Caddy Shack. After several weeks of absentees, Caddy Shack this week came with their strongest team on paper and eager to regain the top position in the PPL, which they lost last week to Kwans Birdie Club. Tony and Gwen both playing for Red Light won their singles and doubles games. So did Don and Dr Ben playing for Caddy Shack. It was Red Light who was leading 5-4 before going into the beer leg. They lost the first set, but won the next two sets and the night overall by 7-5. Happy End played at home against Kwan’s Birdie Club. Last season Kwan’s Birdie lost 9-2 against Happy End and as a result lost the championship, which is something they had not forgotten about at all. Jerry playing for Happy End was on his way to seven-ball Colin but missed, and Colin showed no mercy in potting all seven of his balls and the black in one turn. In the doubles Se and John seven-balled their opponents from Happy End. John, Goh and Colin playing for Kwan’s Birdie won their singles and doubles games. Overall, revenge was sweet for the Kwan’s Birdie players, who thrashed Happy End 9-2 on the night. However, after the match John’s birthday was celebrated and it still became a Happy End… in the end. 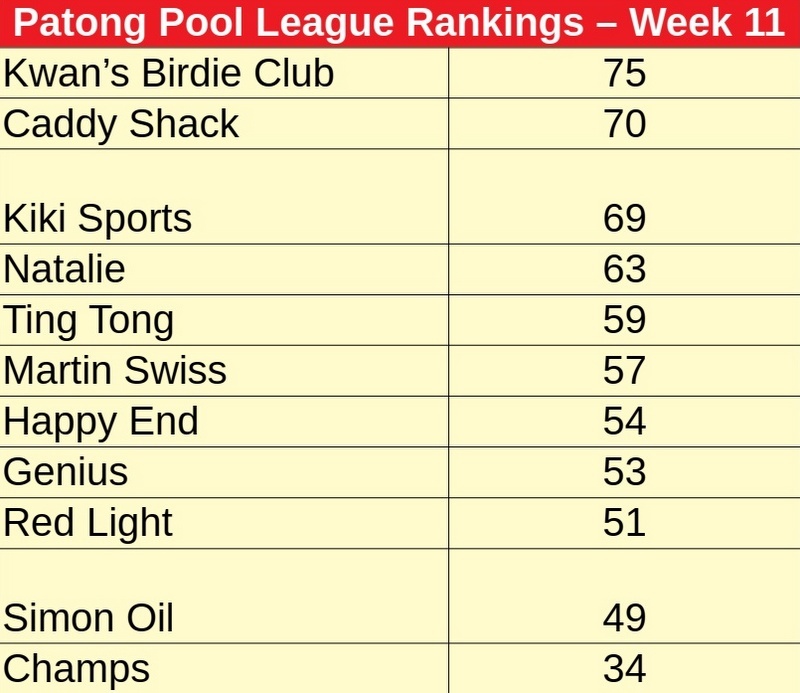 The 12th round of the Patong Pool League will be played on Feb 7. People who are interested to play, as well as visitors, are all welcome to attend at one of the 11 participating bars. 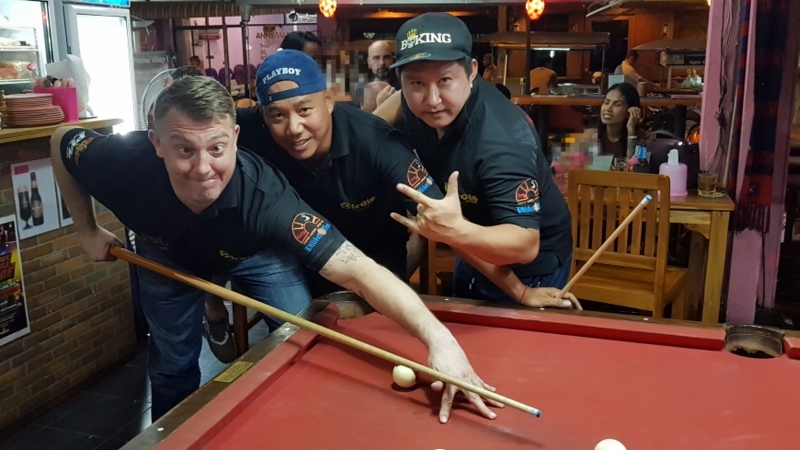 You can also visit our Patong Friendly Pool League Facebook page (click here).